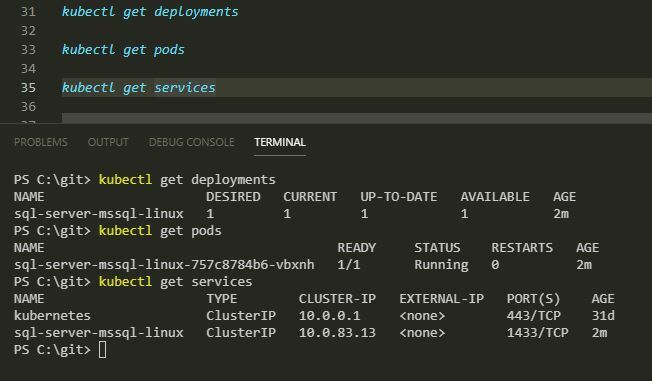 In previous posts I’ve run through how to deploy sql server to Kubernetes using yaml files. That’s a great way to deploy but is there possibly an easier way? Enter Helm. A package manager for Kubernetes. Helm packages are called charts and wouldn’t you know it? There’s a chart for SQL Server! Helm comes in two parts. Helm itself is the client side tool, and tiller, which is the server side component. Details of what each part does can be found here. So the first thing to do is install Helm. Now you can download the installers from the website here but I found the easiest way to install Helm locally was to install the Kubernetes extension for VS Code. Installing that extension will ask if you want to install other tools, one of which being helm. Nice and easy! And that’s how to deploy SQL Server to Kubernetes using Helm! Pretty cool imho. This entry was posted in Azure, Helm, Kubernetes. Bookmark the permalink.